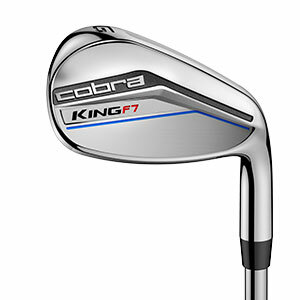 Cobra Golf introduces the most groundbreaking and versatile club into its iron family yet, the KING F7 – further expanding the offering of clubs under the revered KING name. The new KING F7 set of irons, along with COBRA’s first-ever F7 ONE LENGTH set, provides golfers with optimised performance, distance, forgiveness and control with every shot. The KING irons build upon the popular KING F6 model that introduced the ultimate progressive set to the market by incorporating Cobra’s patented TECFLOTM technology to deliver a set that utilises advanced cavity construction to optimise the performance characteristics of each iron. A new PWRSHELL face introduces a thinner face and sole structure that increases the Sweet Zone and delivers distance, precision and forgiveness. TECFLO along with a new Thin, Optimized and Personalized (T.O.P) polymer medallion badge that is lighter than steel, allows the CG to be moved lower to create even more distance and forgiveness. Additionally, CNC milling improves groove structures in these irons to deliver maximum spin and trajectory control throughout the set. Using proven Progressive Spin Technology, Cobra has managed to combine progressive grooves and CNC milling to deliver maximum spin for all iron types. A full hollow design with PWRSHELL face insert in the long irons (3-5) delivers low CG with an extremely responsive face for easier to hit and high-flying long irons. In the mid irons (6-7), a half hollow design combined with PWRSHELL technology delivers optimal CG for more precise, easy-to-hit clubs, meaning more greens-in-regulation. The scoring irons (8-PW) utilise a traditional cavity back design with wedge spaced grooves for added spin and more control to attack the pins. Finishing out the KING F7 set is a specialty wedge design that provides added versatility and enhanced shot control greenside in the sand and gap wedges.